John Akapo is a nomad that followed the music. From his early days as a kid growing up in Alaska where he fell in love with the guitar, to his youth spent in American Samoa singing Acapella and learning how to loop, John Akapo has been magnetically connected to a path of musical discovery. John's family heritage runs deep into the music. As a kid, John was constantly surrounded by music and his uncles were touring musicians that played guitar. His parents had watched family members succumb to addiction from the rock-and-roll lifestyle, so they did their best to keep John and his brothers away from the same pitfalls. "My parents were firmly against the idea of me taking up the guitar," said John. I would have to hide my interest in singing and especially playing the guitar. I looked to my brother's friend for guitar lessons and quietly dove into a wormhole of music that I have never climbed back out of. I would learn to play songs from watching VHS tapes or whatever I could get my hands on. That was how I discovered Eric Clapton performing his MTV Unplugged set and my whole world changed. I was still too young to have known who he was or that he was even part of the British revival of the Blues. All I knew was I wanted more." John dove head first into the origins of the blues and never looked back. Taking a cue from the legends like Robert Johnson, Tommy Johnson, Blind Lemon, Son House, Willie Dixon, Muddy Waters, Howlin Wolf, Buddy Guy, and B.B. King, John began to explore and absorb as much as he could from recordings, movies, books, and magazines. Blues had become his solace. Recording his own original works, John began a professional career as a luau musician, bandleader, solo entertainer, and more recently, a hip-hop producer and vocalist for 13 years, when he sits down to write music he always ends up with a blues song. It's only fitting that he has finally decided to release his first debut album, "Paradise Blues,” as a Blues artist bringing him right back home. "I think my music is like a tree rooted in traditional blues but sprinkled with Pacific salt water," added John. "I’m merely telling a story of where I’m from, and how I got here set to a mellow acoustic blues soundtrack.I play the blues because it feels familiar to me. I feel a connection to the story behind the blues and I’m just trying to continue the story from another perspective. Give me a try and see if I cant make you feel good about being blue." Akapo's eclectic style has won over fans across the globe including the likes of comedians J. Anthony Brown and Russell Peters who was signing John's praises on his Instagram feed. 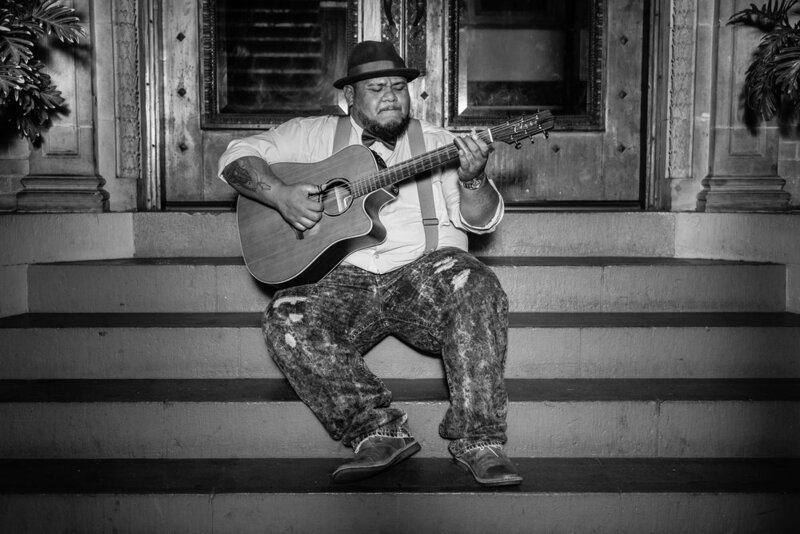 On his musical journey, John Akapo never turned his back on his Samoan heritage or his Hawaiian roots and his experiences on the Island have helped shape him as a person, as well as a guitarist. John embodies the spirit, beauty, sadness, and struggle of the Islands with every guitar lick. "The blues fans that have seen me play, appreciate the fact that I’m from Hawaii yet I make them feel like they're at home in the mainland. The blues is at home here in the islands, and its nothing new. I think the entire blues scene could use some of this 'Paradise Blues'." Never miss an update. Receive news and updates from Mensch House Records.